Special thanks to Taylor Stevens, Paula Berinstein and Kim Urig for making this interview happen! The nomadic culture of the cult became an adolescent’s journey across four continents and nearly two dozen countries culminating in four years living in East and West-Central Africa–this the primary setting for THE INFORMATIONIST. Along this journey I have seen the best and worst of humanity and don’t have to look far to find the depth of soul and tormented conflict that drives my characters; I pull heavily from personal experience and the experience of the ones I love when creating the worlds they walk in. I was in my twenties when I broke free, and leaving everything I knew brought with the fear, a fresh beginning. Refusing to go to my grave with regrets, “what ifs,” or tears over the lost years, I set out to take back what was taken from me. Through trial and error and observing the masters I taught myself the craft, and gradually the gift of storytelling returned. Learning basics that many take for granted has been a journey to be sure, but on the flip side, if I ever need to make breakfast for 150 people, I’ve already got that covered. The focus of our interview will be Taylor’s debut novel, The Informationist, published by Crown and available now. 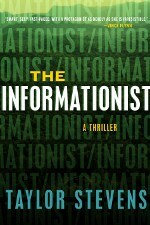 The Informationist is the story of Vanessa “Michael” Munroe, who is an informationist, a job that takes her all over the world gathering information for corporations, governments and other private clients. 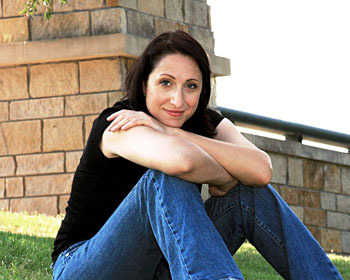 Her latest assignment is to find a wealthy oil tycoon’s daughter, who disappeared in Africa four years ago. I’m not well-versed in the thriller genre, but I do know a thrilling book when I read one. The Informationist kept me awake past my bedtime on quite a few occasions. Each time I opened it, I felt like I was swept into Africa. If I hadn’t had a deadline for this interview, on page 267 I would’ve slowed down just a bit to savor it. Then again, I may not have been able to help myself and gobbled it up anyway. It’s that good and compelling a read. I’m eagerly anticipating the second installment in Munroe’s story, with the working title of The Innocent, due out next year. It was a pleasure and an honor to talk with Taylor Stevens, and you can listen to our conversation below. You can click the link and listen with a program like Windows Media Player, or download it to an iPod or other MP3 player. Enjoy! Contrary to popular belief, you do not need to be Mark Zuckerberg to craft an app for the iPad to which people will gravitate. We repeat—you do not need to be featured in an Oscar-nominated film in order to create infectious, useful iPad apps! I understand how difficult it must seem though. The iPad is incredibly sophisticated, and it’s easy to believe that a similar level of complexity and technological savvy is required to make apps that are just as techno-glammy as the iPad itself. Not so, my dear. Here are three tips that will help you, at this article’s conclusion, head out and get started on your own dream iPad app. To C or not to C. The most frequently used programming language for the iPad is Objective C, which is somewhat similar to C++. Computer programmers familiar with C++ will have very little trouble adapting to Objective C. But for those without a clue, here is a link to a primer on how to understand Objective C’s most elementary components. Note to the weary: computer language is just as nuanced as French or Chinese, but does present some initial challenges, so take care to be patient with yourself when just starting out. You can also completely skip the challenges of Objective C with Runtime Revolution, a system that can convert into Objective C yet utilize dramatically less computer verbiage. Learn from the masters. Admittedly, I’m no expert when it comes to creating mind blowing apps, or apps of any nature for that matter. However, what I am good at is ferreting out the Web’s absolute best and most valuable resources for helping me to do so. I turn my head to the computer programming masters. But in my search for iPad gurus, I wanted to take extra special care to locate honchos who made me feel like even a non-techie like myself could get in the iPad app-making groove. In that spirit, I would definitely steer you, app-hungry reader, to iPadAppsPlus. This handy dandy page walks you step-by-step through the process of creating a noteworthy app, from scratch. Reconnaissance and resilience. The most important edict in creating an iPad app, all matters of programming and comp language aside, is a whole lotta recon work. Rumor has it that at least a dozen new apps are appearing daily for the iPad, which means you’ll need to get ahead of the contemporary trends in apps you’re seeing right now. Anticipate what will be needed for a few months from now—that’s the only way to make sure your app idea isn’t someone else’s current brainchild. The other skill you’ll need in this journey is tenacity, tough skin. The sheer profundity of apps out there makes it extremely unlikely that your first app (which may take weeks or months to fine-tune to perfection) will hit a home run right out of the gate. Think of this first app of yours, successful or not, as a test run. The next app you helm will benefit from the savvy gleaned from this experience, and it might just take off as a bona fide hit. Bio: Jeff Norman is a recent college grad, currently writing from New York City.